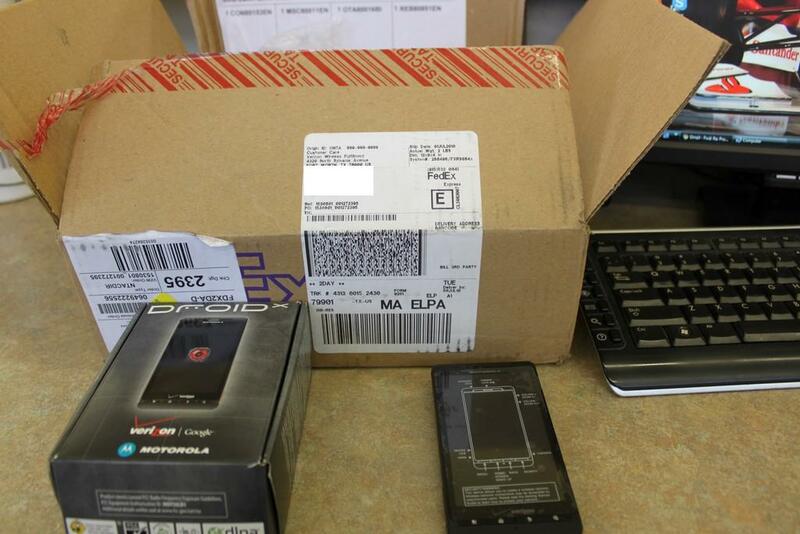 We’re not really even sure where to go with this because it might be the oddest Droid X news we’ve reported, but one of our readers just sent in photos of what appears to be a Droid X straight from Verizon Wireless Customer Care. His brother, who lives in Texas received the device today after calling Verizon and somehow setting up an order. Weird right? Update 1: I ran the tracking number on that box and it shipped July 1st from Ontario, CA and arrived in El Paso, TX today. Ontario is the same site that everything I have ever ordered from Verizon has come from. Update 2: Our Texas tipster said he attempted to place an order for one 10 days ago and was told he could not, but that the rep would call him back as soon the system would allow him to. A few days later, the rep called back and he had placed the order, receiving it today. Well get this. As I was typing this post out, I received another email from someone in Huntsville, AL who works at a Verizon call center and has reported that they just took a call from someone who had some questions about the new Droid X which just showed up on their doorstep. After hitting up some other reps in his center, they too are reporting more than a few calls of people trying to activate Droid X devices. We’re also starting to believe that the @DroidLanding Twitter account is somehow reporting early deliveries of devices rather than clues to a scavenger hunt (SEE UPDATE BELOW). While this is just a loose theory, it could explain why we keep seeing new devices referenced on that account which are numbered into the 20s. Update 3: We’re thinking the @DroidLanding thing is just a coincidence and will continue to assume it is still a scavenger hunt. To attempt to debunk this whole situation, we made a call to the consumer sales number of Verizon and were turned down when asking about the DX. The rep we spoke with said that a VZW pre-sale is not coming and that I would have to wait until the 15th when it hit stores. So on our end, we were unable to confirm the ability to purchase one early. Update 3: Another possible theory – Could some of these be from customers who were allowed to switch their Droid Incredible order over to the Droid X?